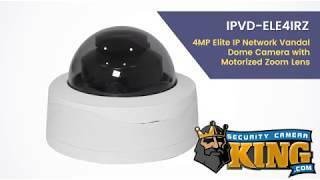 The IPVD-ELE4IRZ is a motorized varifocal vandal dome security camera from our Elite series. 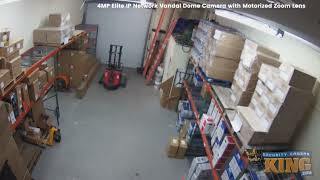 This network IP camera is able to provide 4MP (2688×1520) video at 20 frames per second (fps) or 3 MP (2304×1296) at 30 fps. The lens can be adjusted from 2.7mm to 13.5mm which gives you a view that is approximately 104°-28° horizontally and approximately 55°-16°horizontally. You can use H.265 or H.264 video compression standards to minimize the amount of storage space and bandwidth usage. A Class 10 SD card, up to 128GB, can be used to provide internal storage of video directly at the camera. This camera uses true (120 dB) Wide Dynamic Range (WDR) to provide vivid video even in the most profoundly contrasting illumination conditions. This technology improves the darkest and most luminous parts of a scene to give you the best video possible. Smart Infrared (IR) Technology is another feature of this camera. IR gives this camera the ability to capture details in very low light or even dark surroundings. The smart IR feature adapts the illumination level based on an object's distance from the camera in its view. This prevents too little or too much lighting in parts of the view in order to help provide high detail video consistently.This camera also has the Intelligent Video (IVS) analysis feature which can improve monitoring efficiency. This analytical algorithm makes use of functions like intrusion and tripwire detection to respond to events in a more dynamic manner than previously possible. 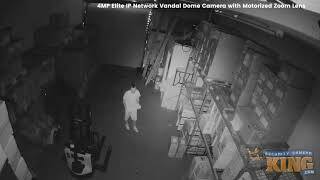 When this camera is set to 2.7 mm you can detect objects at approximately 210 feet, observe objects at approximately 85 feet, recognize people at approximately 43 feet, and identify people at approximately 20 feet. When this camera is set to 13.5 mm you can detect objects at approximately 728 feet, observe objects at approximately 292 feet, recognize people at approximately 144 feet, and identify people at approximately 72 feet. A 2 year warranty is included with the purchase of this camera, along with FREE U.S. based tech support.